Today I got a bunch of mail, it was the first time I have been to my mail box in days so be patient if you sent something I am slowly opening it all today and tomorrow. I had my first exam today and I have another quiz tomorrow. I'm doing my best to stop in to keep everyone posted on things. I had stopped over at Crackin Wax and noticed a sweet card from the 2009 Topps Series 2, and it is probably one of the few cards I actually wanted from the set. I left topher a comment more or less offering an unborn child or my soul for it despite the fact that it is a manufactured item and Pujols has never even laid eyes on it. I still love it. topher was kind enough to ship it out to me without telling me and it was the best part of my day today, well this and my twist from DQ. Check it out!!! I am so happy, and it was a pleasant break from studying the phases of mitosis (snooze). My pictures are not as nice as how topher does his blog, but I make do. If you get a chance and you haven't stopped by Crackin Wax, you need to do it. He does a great job with the blog and with the pictures. OK, you guys go read that and I am going to study some more and come back later perhaps with another envelope that I am dying to open. Next up will be from Waxaholic, my dear ol' buddy. Aw man, nothing I sent you is near as good as that! topher, it's Topps what else would we expect? beardy, trust me when I tell you that anything I need is just as good. 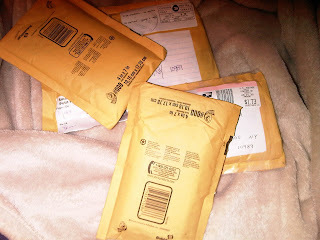 And I got your package today so stay tuned for the blog, it may be a few days, lol. Thanks in advance. 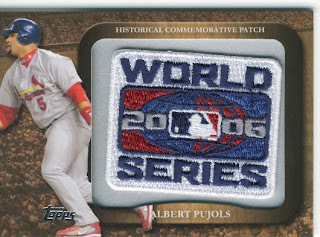 I think we can work a trade for that Pujols W.S patch I may even open the vault for it. I guess the real question would be what card have you been thinking of lately? Jay, I'm not trading that card unless I am misunderstanding your proposition which is entirely possible. tigre, e-mail me and we can talk strategy. That is a nice gesture and a nice looking card! Curious, any interest in a trade for Piazzas? I can try to dig up all of your wants. Nothing special, mostly base chrome and UD/Topps. O.K I guess I will put this Cano, Cabrera, Damon Multi colored triple patch swatch relic #ed 2/3 back in my drawer. I didn't think you would budge, but I thought I would give it a shot.